I had the chance to attend a Bills training camp practice this weekend. It’s always a fun experience to see the team in person. 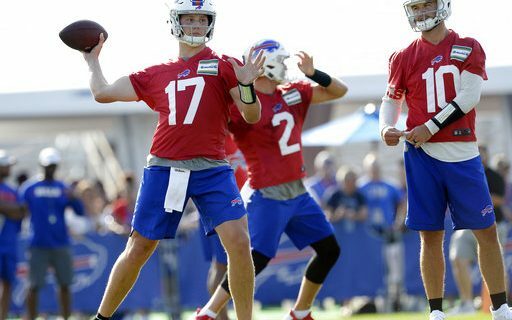 While not a whole lot usually goes on during a practice, seeing the players display their talents is good for any Bills fan. In this case, it was all about seeing Josh Allen in person. Even from the bleachers, he stands out among the quarterbacks in every way. He is physically superior to Nathan Peterman and A.J. McCarron. Same for his arm. Even in warmup drills against no defenders, Allen’s passes are so much more impressive in their velocity and power. Once the actual practice started, not all of those passes looked as good. But watching Allen in drills helps you understand why the Bills and all of the NFL were so high on Allen. *There were glimpses of what Brian Daboll’s offense will look like. On consecutive series, two plays showed that. First, Allen half-rolled to the right and flipped a pass to tight end Jason Croom. It was an easy throw for Allen guaranteed to be a completion. *Then, later in the practice, Daboll called a bubble screen which Allen made the easy throw to Croom on the left. These are staples of what NFL offense are all about. Easy throw, misdirection to free up a receiver for a solid gain. *Daboll is fun to watch. He is animated, and always coaching. A bad play prompts him to get right with the quarterback and evaluate the mistake. A good play prompts a big wide slap of the hands or a pat on the helmet. *While neither’s arm strength compares to Allen, McCarron’s ball seemed to have a bit more zip on it than Peterman’s. But Nathan’s decision-making was crisp, and he appears to have a good sense of what the offense wants to do on each play. *Cornerback Vontae Davis is impressive physically. He is an upgrade in that department over E.J. Gaines. Davis just carries himself like a veteran, who knows where to be and what to do. *Terry & Kim Pegula were on the sidelines, and Terry was especially focused on the field. He really seemed to be watching every play and while I’m just guessing, he always seemed to be focused on the quarterbacks. *Having covered the Bills for as long as I have, it was strange to me to not see some familiar faces on the sidelines. Longtime Bills staffers Bud Carpenter and Woody Ribbick are no longer with the team, and their absence was noticeable. Especially Ribbick, who was always running around handling equipment or playing the role of QB for the lineman’s pass rush. The Bills are back to work at camp on Tuesday, and they’ll have an open practice at New Era Field on Friday. I encourage all Bills fans to get out and see the team, so you can make your own observations.